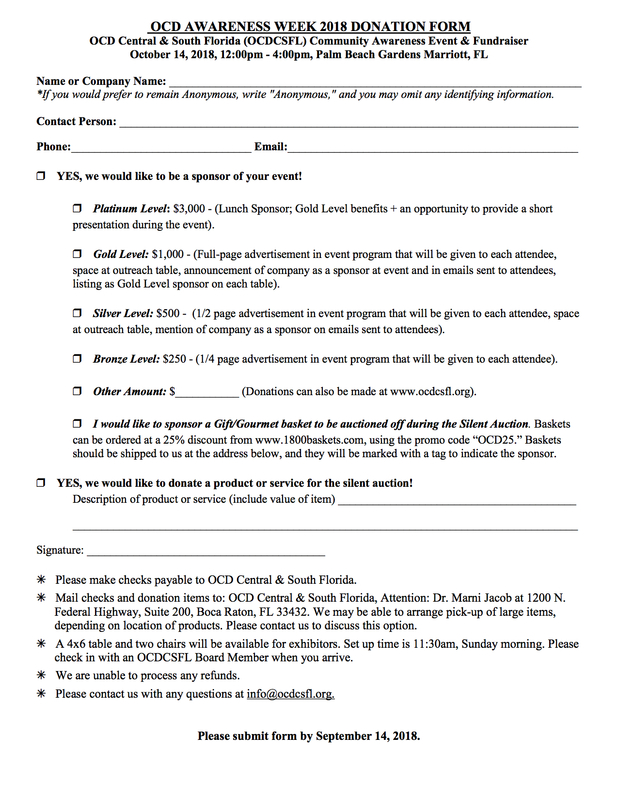 Interested in Supporting the OCD Central & South Florida (OCDCSFL) Community Awareness Event & Fundraiser? OCD Central and South Florida (OCDCSFL; An Affiliate of the International OCD Foundation) and Florida Psychological Association (FPA) – Palm Chapter are collaborating to present a workshop for 3 CE’s that is FREE to FPA Members and IOCDF (International OCD Foundation) Members! Free continental breakfast will be provided! Participants will learn to differentiate between scrupulosity and its impact on the OC sufferer and appropriate faith belief. Participants will be able to explain how the use of faith-based interventions in concert with CBT can dispel OC thoughts and actions. Participants will be able to utilize faith initiatives that support the family member(s) of the OC sufferer. Participants will be able to demonstrate awareness of the typical co-morbidities which occur in OCD. Attendees will understand how to utilize best practices and evidence-supported treatments (ESTs) in diagnosing and treating Obsessive-Compulsive Disorder (OCD) presenting with co-morbid conditions. Attendees will be able to demonstrate up-to-date knowledge of the intricacies of case formulation and other typical complexities of OCD presenting with co-morbid conditions. Cost: FREE for FPA Members; FREE TO IOCDF Members, $30 for Non-Members, $10 for Students. Register Online at http://www.flapsych.com (Community Events). Please register by March 1st, 2018 to secure your registration. Registration fee will be waived for non-members who mail in an FPA membership application with their registration form. Full refund is available with notice of cancellation 48 hours prior to the event. The Florida Psychological Association maintains responsibility for the program and its content. The Florida Psychological Association is approved by the Board of Clinical Social Work, Marriage and Family Therapy, and Mental Health Counseling as a provider of continuing education. OCD Central and South Florida is co-sponsoring it’s first annual conference with Rogers Behavioral Health! 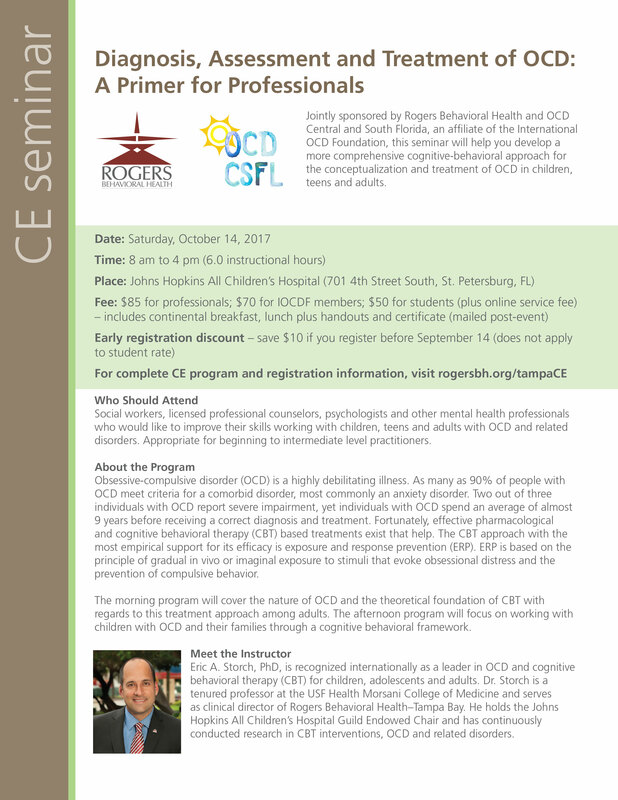 Jointly sponsored by Rogers Behavioral Health and OCD Central and South Florida, this seminar will help you develop a more comprehensive cognitive-behavioral approach for the conceptualization and treatment of OCD in children, teens, and adults. Obsessive Compulsive Disorder (OCD) and related disorders are common presentations in the clinical setting for both children and adults. However, many clinicians are not familiar with the application of cognitive behavioral therapy to the treatment of OCD, specifically, the use of Exposure and Response Prevention (ERP). This workshop is divided into two presentations. The first, by Dr. Marni Jacob, will cover the basics of assessing and diagnosing OCD, differential diagnosis of OCD and related disorders, and how to implement ERP treatment strategies. Important factors in treatment, such as family accommodation and reassurance-seeking will also be addressed. Co-presenters Dr. Judith Migoya and Dr. Elizabeth Penela, of Pediatric Psychology Associates, will then present on implementing ERP with more challenging presentations, including scrupulosity, self-harm, and sexual obsessions, strategies for addressing exposures that do not go as planned, and incorporating others (parents, significant others) into ERP treatment. July 7-9, 2017 in San Francisco. Click on image for more details and to register.